It’s come time we heard again from one of my favorite cowboy singers: Carl T. Sprague. This is a record that I’ve had since my earliest days of collecting, one of about a hundred that I inherited from my great-great-grandfather. As such, it’s been in my family since its original purchase in 1925. Like many of that bunch however, the condition leaves something to be desired. I’ve been searching fruitlessly for a replacement copy for some time, but as of yet no cigar. (If you happen to have a copy you’re looking to get rid of, let’s talk.) It escaped my interest for a long while after it arrived in my possession; before I’d listened to it, I assumed it was just a run of the early vocal record like all the Henry Burr and John Steel and whatnot that the old folks seemed so fond of. Once it finally made its way onto my turntable, I realized I had been missing out. It piqued my interest in old folk music and introduced me to Carl T. Sprague. I later delved deeper to uncover more about the history of both songs, and became even more enthralled. Suffice to say, it’s since become one of my favorite folk music records. Both songs were popular comical songs in the second half of the nineteenth century, and both were scarcely recorded in the next century. Though Sprague is credited on the labels as composer of both sides, the songs actually predate his birth by quite a few years. Both were originally published on broadside song sheets, as was common practice in the several centuries preceding 1900. Victor 19813 was recorded in Camden, New Jersey on August 3 and 5, 1925. It was released in December of that year, and cut from the catalog in 1928. They are among the earliest electrical recordings made, only a few months after Victor introduced their new process. The Discography of American Historical Recordings notes that Victor’s “Special Booklet 1925” as a source. I’m not entirely sure what that means, but it’s possible that this record never saw widespread release. Obviously staples of his repertoire, Sprague re-recorded both these sides in 1972 for his eponymous LP. First, is Sprague’s first recorded side, “Kisses”, a song which dates back to the days of broadside song sheets. It was originally published in 1882 as “Sock Her on Her Kisser”. Another version was recorded in 1941 by Lewis Winfield Moody for the Library of Congress by Robert F. Draves, under the title “Everybody Has a Finger in the Pie”. Chubby Parker of WLS recorded “The Kissing Song” in 1931, which may be a version of the same song, but having never heard it, I cannot confirm. Canadian folklorist MacEdward Leach collected a version of the song as “Turtle Dove” in Newfoundland in 1951. The DAHR makes note that a re-make (take “5”) of “Kisses” was recorded on June 22, 1926; this take appears to be the originally issued one (“3”). Sprague’s 1972 re-recording of the song was titled “Kissing”. 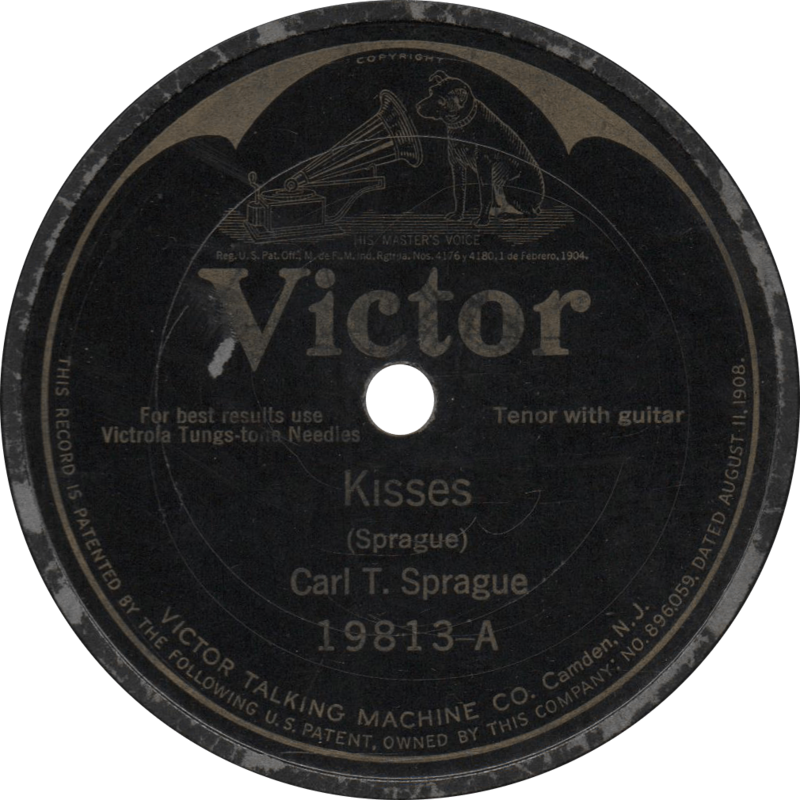 Kisses, recorded August 3, 1925 by Carl T. Sprague. 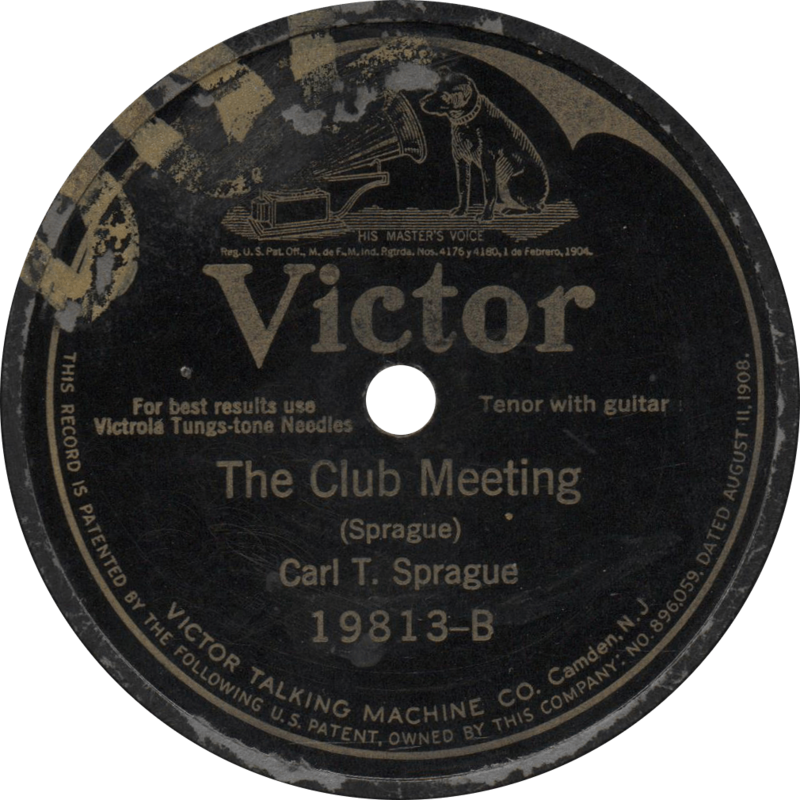 The Club Meeting, recorded August 5, 1925 by Carl T. Sprague. This entry was posted in Records and tagged 1920s, 1925, Carl T. Sprague, Cowboy, Folk, Hillbilly, Singing with Guitar, Texas, Victor by R. Connor Montgomery. Bookmark the permalink. You’ve got a rare one there. I don’t have a copy nor have I ever seen one offered via auction sheets.